Posted on January 7, 2013, in Critiques, Theories, and Random Thoughts and tagged animals, characters, Deathgate Cycle, fantasy, Hidalgo, horses, pets, Tolkien. Bookmark the permalink. 4 Comments. I love Mouse, and even Mister, in The Dresden Files. They’re great supporting characters, Mouse especially. They’ve got personality! It’s great! While I tend to agree with the idea that animals should be seen as characters and to not do that is at the best of times an opportunity missed and at the worst times makes the characters look unsympathetic or even psychopathic in nature. However, I think a lot of the use of animals in some fantasy (Wheel of Time comes to mind) is proper and what you would expect given that fantasy is often meant to be a sort of alternative historical world and through our history we have often treated animals as tools more than as companions. Horses were extra muscle we used in hard labour and while it might be nice to have a good relationship with your horse and enjoy all her ups and downs in personality you still were more interested in if she was healthy, if the shoes were all on, signs of exertion etc. An experienced horseman would view horses in quite a callous way from how we today enjoy horses (large pets basically), they were prime tools meant to be used and they were expensive tools so it was far more important that the tool was good at the work at hand, not fun to be around. Anyway, didn’t mean to ramble but it is also important to note that Viggo’s character is quite different to what the norm would have been (especially a few decades further back in time), and while it is nice for such interaction it might not always be natural or fitting. That’s fair enough. I’m not necessarily saying that their interaction with them ought to be overly sentimental (I certainly agree that horsemen of old saw horses as tools), but that part of using the tools was being aware of their behaviors and identity as living creatures with individual characteristics. Take Kvothe, for example–he rides the hell out of that horse and sells it immediately afterwards, but he also treats it like a living thing. I feel that, in the same sense as you might treat a coffee barrista and a taxi-driver as ‘tools’ in your daily life, so also would animals be treated. Yes, the horse is there to take you from point A to point B, but you don’t want it to throw you, you don’t want it to run away, and you need to make sure it’s willing to obey you. These things require a degree of personal interaction with the creature which can be used to enhance certain scenes. Yeah, I think we are sort of on the same page, it is easy for a modern human who might not have even ridden a horse once to fail to grasp the interaction necessary and perhaps portray it a bit like jumping on a bike. 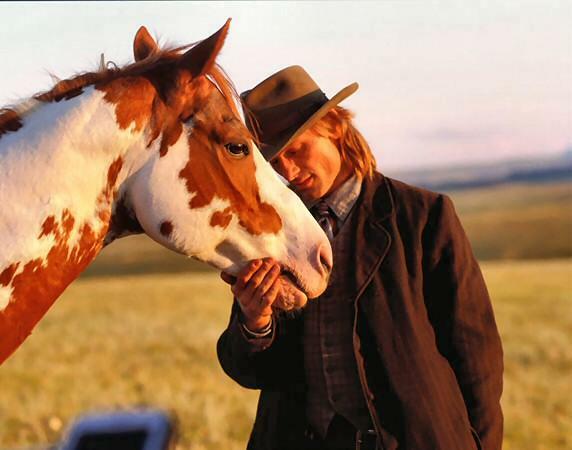 But at the same time the loving interaction of Viggo’s character Frank with his horse might not be the natural reaction either. To me, that is a sign of Frank’s love for that horse and for the art of horse-training; he is a man seduced by the thought of the horse just like there are horse-lovers and dog-lovers etc. these days but in many ways he is closer to a modern appreciator of animals than what you would expect. Mat’s reaction to horses in Wheel of Time on the other hand is perhaps closer to what you would expect from a man used to working with horses, especially a few centuries back in time. He expects horses to behave and that is it; their behaviour should be mandated by the rider and any little personality behaviour might be nice but it isn’t important. He looks for hoof-cuts, feel of the tendons, muscle build, spine curvature, gloss of coat etc. not a lack of grumpy behaviour (good riding horses can still be grumpy when riderless). In many ways he looks at a horse how he would look at a servant, it is still a living being but the important qualities aren’t necessarily connected to the character of the living being and how much of a friend he will be with it. But as you say it is a great opportunity to add a little empathy to your character (or lack thereof if that is what you want) and increase the feel of realism to your story.